Hazel's Quilts: Christmas QAL - July pt2 - Name the Scarecrow! Christmas QAL - July pt2 - Name the Scarecrow! Well it is turning out to be a scorcher here in the middle of the UK - all the windows and door are open, the cats are flat out in the shade, and this gentleman is sitting taking in the sun on my bench. I've fished out the fabrics for my Christmas challenge, and now I've done some housework, I'm nearly ready to sew. But I need to sort something out first, and could do with a bit of help. 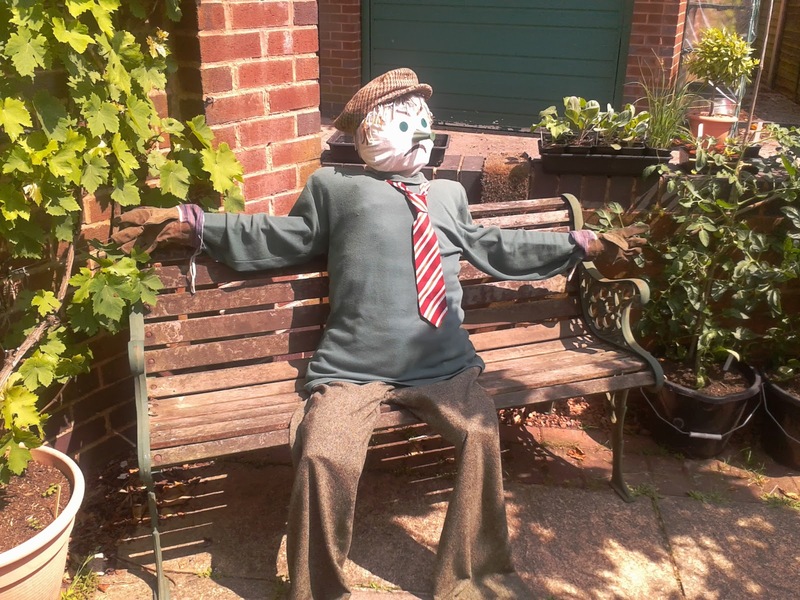 I'll be taking my gentleman over to the Hill allotment site later where I grow my fruit and veggies - we have a scarecrow competition running, and he has to be in place ready for judging next week. I know he's looking grumpy, but then he is there to scare the pigeons off my cabbages! But surely he should have a name! What do you reckon he should be called? Groan - very good, Sharon! I knew I'd get some puns going on here! I like Sharon's idea. Or how about Homer. If he was yellow, he's be Homer, Sunny. He doesn't look remotely Scottish to me - and now I'm/ humming "Donald, where's your troosers" too, dratted Hobbit! My grandfather had a hat that looks like that one...so my suggestion is "George"! A mouthful, I think, Donna. A Commission - but Second Guessing! Christmas QAL - July - PS. Christmas QAL - Jul pt7 - Biscuit, anyone? Chistmas QAL - July pt5 - Curses! Christmas QAL - July pt4 - Brainteasers! Christmas QAL - July pt3 - by GEORGE! Christmas Quiltalong - July - whoop, whoop!